Actually, the trees just look huge and the shrubs look scruffy. 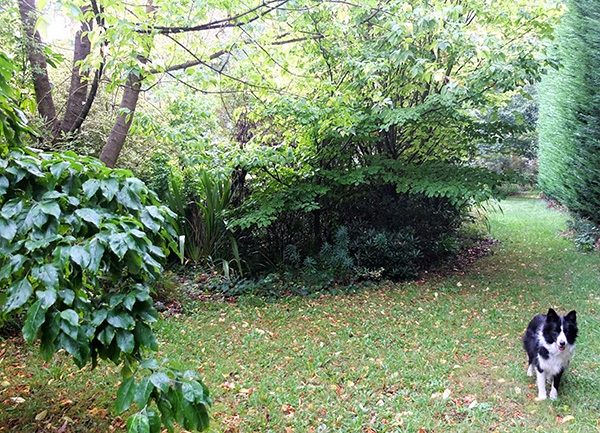 There's still a lot of flower colour from the autumn perennials, and of course some lovely greens to enjoy. But are there too many large Phormiums? The dogs and I, closely followed by the two Freds (catlets, having just had 'that' procedure at the vet), have been walking up and down the water race. I've recently cleaned up a lot of bulky ferns, so I guess there's less visual competition. What do you reckon, dogs? No, I don't want to find a stick and/or throw the ball. I need to think this through carefully. Some of these flaxes are massive. Too many are too big? I have new outdoors autumn footwear. 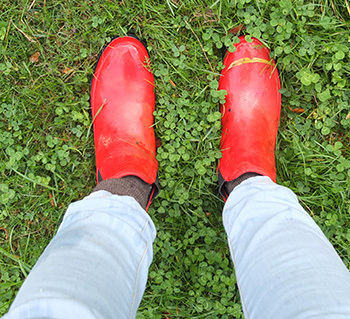 I have 'scored' a pair of red rubber ankle boots, lightweight and waterproof, for just three dollars, hee hee. Indoors I now wear my Ugh Boots, where 'ugh' rhymes with 'snug', hee hee. PS I am NOT allowed to wear them outside, even on the driveway. So now it's time to do some good autumnal gardening. The dogs are bored, and the day sweeps on - it's nearly lunchtime. Oops. Change into my red outdoor shoes first. Aha! 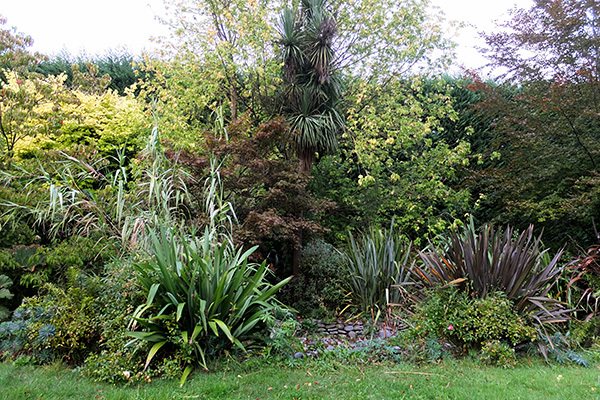 Action woman has just dug out the gruntiest, over-sized Phormium. It was originally striped, but all the leaves had reverted to the species. I've also removed more clumpy ferns, and an Iceberg rose (now in a bucket of water). Four hour's work (Phormiums are tough customers) swinging the shovel, and all the mess is dumped underneath the Leyland shelter hedge. And so another autumn day slithers by, the fire ban still in place, as I create another burning pile. Aargh! Off days...	Top Too scary!